A lot of moms swear by sign language. 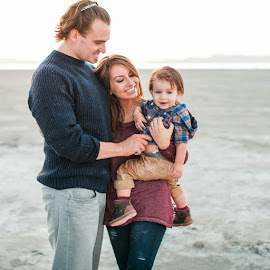 They say that it's really helped their baby who can't vocalize what they want, keep from getting frustrated because it allows them to communicate. I think this is a great idea. We tried it with David when he was younger, but truthfully we weren't the best with consistency. We'd forget to sign and it just slowly phased out for us. But, one thing we have been very good at is keeping up with repetition of certain words verbally (non signing). When your baby starts to talk it's really exciting. 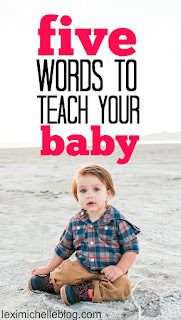 And it's great to hear them say "mama" or "dada" or "bubble" or any other random word they seem to pick up, but what's really helped us is also focusing on a few key words that I will share in a minute. Typically, David learns new words just by hearing them in context, but there are several that we have intentionally taught him so he can communicate without crying. These words are similar to the essential words most parents teach babies with sign language, but of course we don't sign them. Having David be able to communicate these to us has really helped to minimize tantrums over the past 10 months. In a normal situation where he might have cried out of panic, fear, or frustration in the past, he just tells us what is wrong. 1. More- David picked this word up very quickly.It is one of the first we worked on. This is great for feeding time. We no longer have to worry if he's had enough. If he's still hungry he asks for more. 2. Baba- of course this is on here. Most babies seem to pick up this one on their own. But, it's still an essential. 3. Eat- along the same lines as the others, we taught our son to say eat when he is hungry. 4. Mi-mi- (pronounced me- me) this one will be different for you. We're bilingual in this house, so mi-mis is Spanish baby talk for sleep. You can use what you like for this, maybe "bed," "night-night," "sleepy," as long as it means go to sleep/tired. I personally love this one! David will oftentimes let us know when he's tired usually even a few minutes before scheduled bed time or nap time. It makes things so much easier. There have been times when he's pulled us by the hand to his crib saying "mimi." OKAY, so far we have covered the essentials. Now you're baby/toddler can tell you when they're hungry, want more food/water, are thirsty, or are tired. Time for number 5. This is the newest one we've introduced. 5. Help- This word works in so many normally frustrating situations for a toddler. For example, yesterday David got stuck in between two kitchen chairs. Normally he would cry & freak out. Instead, he calmly said "help help help" over and over til we helped him out. He also says this if he needs help opening something, or reaching something. He uses this word all the time. I wish I would've thought to teach him it sooner. 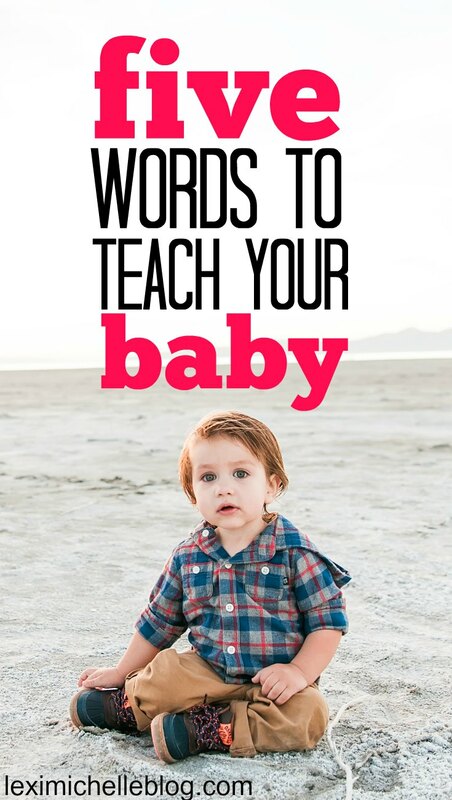 Of course these aren't the only words to teach your child, but these are the words that have helped us the most to eliminate freak outs. It just takes a little repetition and reinforcement. The younger your baby, the more repetition they will need and as they get older it gets easier. David is now 19 months and teaching him a new word only takes repeating it a few times, but in the beginning it definitely required a little more effort.